Chocolate should be a food group, it’s that simple. If that statement resonates with you, and you’re in The City Different, check out the delicious Santa Fe Chocolate Trail. The four shops on the trail each put their own spin on the bean, including use of that New Mexico staple, chile. If you’re not planning to be in Santa Fe anytime soon, these unique shops do mail order and all but one are on the web. 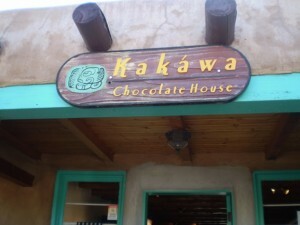 Kakawa Chocolate House, located in an old adobe building on Paseo de Peralta in the historic area of town, is dedicated to the ancient art of chocolate. Their name is derived from the Aztec word for chocolate; their specialty, Mayan elixirs. They also offer European versions of this New World drink brought to the Continent by returning Spanish explorers. The good news, these restorative drinks come in wafers that can be taken home or easily shipped. You don’t have to live in Santa Fe to enjoy these. Kakawa’s website offers 19 different wafers in three categories. The Mesoamerican-style wafers are infused with native herbs or their modern equivalents. Most are unsweetened. The European varieties use sweeteners. The latest addition is a selection of contemporary wafers; a modern interpretation of European-style elixirs adapted to 21st century taste-buds. And great news for health-conscious chocolate lovers, Kakawa uses honey and agave syrup as sweeteners. 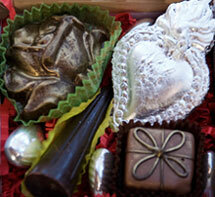 The shop also offers a selection of hand-rolled, hand-dipped truffles made in-house. The selection varies depending on what they are creating at the moment. There is almost always a New Mexico chile truffle available. Kakawa sources many of their ingredients locally. Favorite: dark chocolate, chile truffle. Chocolate Smith occupies a modern, antiseptically clean shop on Cerrillos Road. Featured on the Food Network’s Road Tasted with the Neelys, the shop’s unusual specialty is chocolate pâté. Ganache is shaped, chilled and then hand-dipped ten times in the same European-style wax that coats Gouda cheese. The pâté comes in six flavors including a local ancho chile version. There are a variety of shapes; red and green chiles are a staple. There are also animals, southwestern themed shapes and seasonal ones for holidays. Their web-site offers the pates, Signature Selections which include the Dark Chocolate Chile Sampler, the Santa Fe Sampler and the Chile Bark Sampler; Custom Selections and more. CG Higgins Confectioners is easier to find on the Internet than in person. The small shop is at the intersection of St. Francis Drive and tiny Ninita Street; you can easily drive right past it. Ever since the shop was featured on Road Tasted with the Neelys (same episode as Chocolate Smith) people go out of their way to get there. 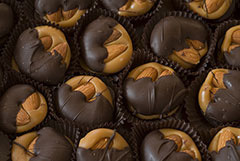 The business, originally called Chuck’s Nuts (after owner Chuck Higgins) had a name-change in 2007 to better reflect the shop’s new direction, candy making. Besides chocolates Higgins makes caramel corn, fudge and brittles. Their website offers chocolate drinks, fudge, caramel corn, brittles and a variety of non-food items. Higgins says he makes the best brittles in North America. He attributes this to the altitude (baking soda reacts differently at 7,000 feet), the dry climate and that the candy is made in small production batches by hand. Walking into Todos Santos, a tiny shop in the courtyard at historic Sena Plaza is like stepping into a shop south of the border. The décor is funky Mexican. Dia de los Muertos (Day of the Dead) heads, milagros (symbols used when praying for miracles), Mexican cut paper decorations, flowering over-head branches dripping with kitsch and more decorate every inch of the small space. The shop’s been featured on the Food Network’s Giada’s Weekend Getaways, and Food Finds. 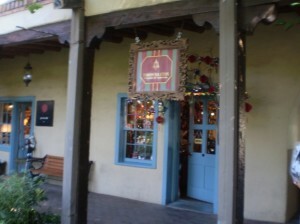 It was also a Santa Fe stop on HGTV’s Dream Home 2010 giveaway show. Owner Hayward Simoneaux incorporates the gold and silver leaf techniques he learned as a picture-framer in his signature edible gold and silver leaf covered milagros. Also house-made: toffees, a signature chocolate bar and nut clusters. The shop also offers marzipan, nougats, hard-candies, caramels and more sourced from France, Italy and Belgium. Shoppers will also find confections from small artisanal producers Simoneaux has discovered in the United States. Simoneaux is not an Internet kind of guy. He doesn’t even have an email account. If you want to buy his unusual offerings, you have to phone the shop and chat. Hours are roughly 10-6, Sundays by chance. If the spirit moves him, Simoneaux may lock the door and take off. Any other favorite Santa Fe chocolate shops to recommend? Be sure and leave a comment. Hmmm...you're making it awfully tempting to skip sessions at Left Coast Crime in favor of chocolate explorations. Bless you for this, Janet! We can at least get to the one on the plaza. I think I might have been there, but even so I can go again. There used to be one called Michale Murphy's or something like that in the shops below the lobby of LaFonda. It had the best chocolate covered orange peel ever!And if you're down there step across the hall and say hello to my friend Joette who has a photography shop there. Sells mostly landscapes. Oh, how I wish I was going! I'll try hard to say HI to your friend, Judy! And to find the other chocolate shop. Thanks for this, Janet! I'm madly scribbling notes so I can stop at some of these stores when I'm at LCC. Posting late, but I'll be joining whoever's going to hunt for chocolate. I'll also be taking in a cheese shop. Game?